I didn't get a chance to post about the awesome family baby shower my sister in law threw in April before munchkin arrived but am so excited to share it with you now! It was nautical themed and the invitations were so adorable with Ahoy It's a Boy on them. The decor was top notch! If anyone is throwing a nautical shower, I know some of these things came from etsy. There were fun banners, various ships, a sailor hat and lighthouses that both of us and my mom happened to have for decorating the table that contained the Wishes for Baby cards and the Advice for the Parents-to-be cards. There were also thank you cards that matched the theme where the attendees went ahead and filled in their address - this is something Megan had done for her at one of her showers and it is a real time saver when you have so much going on with a new baby. My mom gave Megan the Little People Marina to put out which I played with as a kid. Love all the old Little People stuff. This diaper wreath was amazing! It said Baby Munchkin in the center and is from etsy. With the wonderful host! She was so sweet to host a baby shower with a 2 month old. Now let's talk about the amazing food. First the diaper cake on the food table was adorable. We cloth diaper but I haven't really had to buy any disposables for when we travel, etc. due to diapers from my showers. It was the perfect centerpiece. The food was catered by someone that catered one of Megan's showers and it was delicious! Chicken salad, veggies and dip, fruit, spinach artichoke dip and some sort of cheese dip in the hollowed pineapple that was to die for! I could totally go for some of that right now. The cookies are from Blue Flour Bakery in Columbia and they are so so good! I first had their cookies at the shower I threw for Megan when her mom brought them. They are a great shower dessert and I prefer cookies over cake. With Miss Abby right before we all ate. After eating, everyone filled out the Baby Wish cards that I cannot wait to share with Munchkin one day and the Advice for the Parents-to-be. Then I opened the gifts. My chair even had a Mom-to-be sign and the mantle was all decorated too with BABY letters Megan made and some onesies and burp cloths y mom made. One of our close family friends was really sweet to come up from FL for the shower. As well as my aunt from FL and cousin from Charleston. And my sweet niece. She was the flower girl in our wedding and is so grown up now. There were cute cookie favors for the guests to take as they left also from Blue Flour. I actually froze two of these for us to enjoy post baby and ate them a couple weeks ago and they were still just as delicious. Eric helped out with clean up and packing up the baby loot. 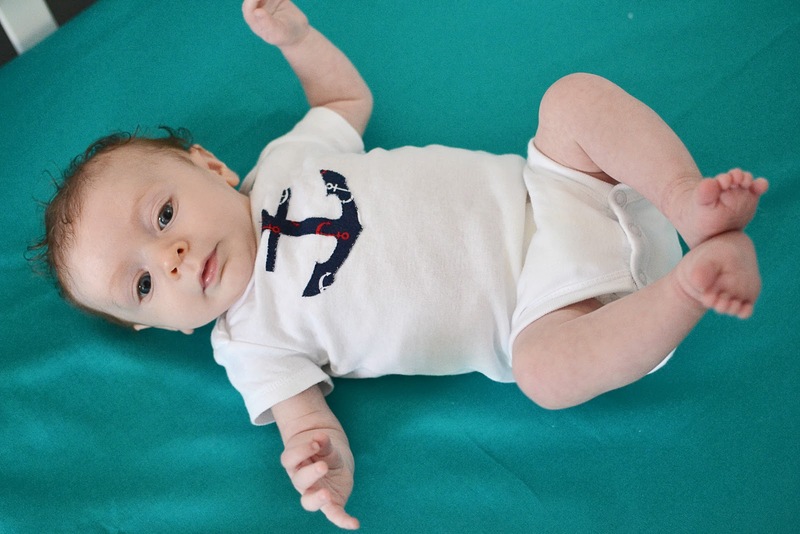 And of course this little guy dressed up for the party in his nautical wear too at a little over 2 months old!